Do you have an accident waiting to happen at your parents house? Comments Off on Do you have an accident waiting to happen at your parents house? Are your parents climbing ladders and step stools because they feel they can do things themselves? Climbing the ladder to clean out the gutters or touching up the paint is something they always did and still feel capable still doing. Years ago that wasn’t a problem; they were a lot younger and much more agile and steady. But things are changing. How can you stop them from doing this before they have that accident which could put them out of commission permanently? Whether it is fixing the dripping kitchen faucet, changing a filter or light bulb, putting in the screens, or anything else that needs fixing. What peace of mind would you have knowing that Dad and Mom are not climbing ladders or step stools, crawling under sinks, or make many trips down the basement stairs which are all possibilities for accidents. There are plenty of small businesses that can help you help your parents. Some of them you and set them up on a monthly retainer, and they will stop by your parents home on a regular basis throughout the month and take care of things that need fixing. You know all the little (and not so little) do it yourself projects that you don’t have time to do for your parents. Arrange to have everything done without anyone in the family climbing a ladder and taking unnecessary risks. All you need to do is keep a perpetual “honey do” list and once a month, as regular as clock work; this company would come in and do what is on the list. If the job was too big or more involved then they may need to schedule more time, but for the most part routine maintenance and repair projects that Dad or Mom want or need done are finished and scratched off the list. Consider this type of service as a gift for the entire family! The value of any treasure discovered is always dependent on the quality, uniqueness, and scarcity of the particular items. Attics have always been the source of great treasure hunts for years, as well as the source of great agony. For families who have to clear out and dispose of their valued treasures, it is difficult. 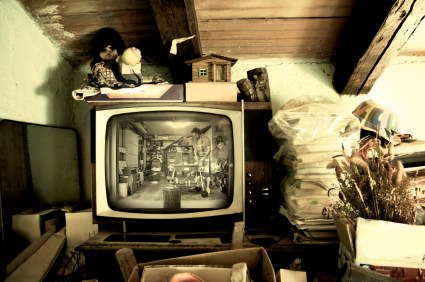 Time and patience is a valuable commodity when sorting and clearing attic treasures. Care and concern should be given with all items as there may be items that have both monetary and sentimental value, or NOT. If you are fortunate enough to find one or two pieces in that category, then you need to decide what to do with them. Even finding a piece or two with sentimental value only – something you had long forgotten about it — will be a wonderful discovery. Once the Treasure Hunt is complete and the “stuff” has been categorized what happens now? For the items you have decided to keep, it depends on the situation you and the family are in; you might be moving so will these items move to new location or will you be taking them to your home? Or you may be staying for a while longer so that will require repacking and labeling the contents of the carton or bin. Be sure to put a date on the bin so you know how long ago you last viewed the contents. Put these repacked and organized containers neatly in a designated space for future access. Now, you need to take away the items designated as trash, donation, give to family, or sell. Move the trash, if possible, directly out to the curb, a dumpster or at least to the garage to wait for trash day. If you have not already scheduled a donation pick up; do it now. Move the donation items down to the garage clearly marking them as donations – not to be mistaken for trash. Resist the temptation of second guessing your decisions. Put all items for sale in one spot (either leave them in the attic or garage marked sale items). Then determine what type of sale to have. Arrange for an appraisal, if necessary. Set a date, even if it is weeks or months away, it will help motivate you to complete the project. For items that you truly feel have monetary value but you don’t know what it is, I recommend strongly that you pay for an appraisal from a qualified independent appraiser, who knows furniture or artwork. By having an appraisal of the pieces in question, you will be able to make an educated and informed decision on what you want to do with the pieces in question. You won’t walk into a store someday and see your piece (or something very similar) for sale for hundreds of dollars and you sold it for $5 at a moving sale! Patience, persistence, and many helping hands are the basic elements needed to complete this project. It could take days, weeks, or even months, depending on the level of all available elements at any point in time. Back in the day, growing up in the fifties, the Fourth of July was always filled with family and friends celebrating our national birthday, swimming, a backyard cookout, and going to the fireworks. I grew up in Concord, Massachusetts, the home of important historical places, events and literary notables, such as; the start of the Revolutionary War, home of Louisa May Alcott, Henry David Thoreau, and his Walden Pond. Growing up in Concord meant we learned all these things, and we even had the privilege of taking swimming lessons at Walden Pond. 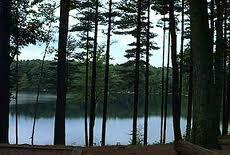 However, Walden Pond’s notoriety was too much for most town residence and was often very crowded with visitors. So many ‘townies’ opted to swim in a lesser known, smaller, but just as beautiful, pond called White’s Pond. To swim at Whites Pond, you needed a membership for the Whites Pond Association which cost about $15.00 for the season. Our family had a membership and it was a life saver on many hot, humid summer days. On Holidays, like the 4th of July, we would spend hours at the pond. All the kids would go with my older sister supervising a troop of 7 or 8 kids. We all knew the rules, and my sister was always willing to bend the rules a bit, and it was a great time. Eventually, later in the afternoon, the adults will come along with possibly another couple of kids who came late, and for the next hour or so we played and swam with the adults before going home for our cookout. Our cookouts were huge affairs, with lots of friends, family, and food. There was the usual cookout staples; hot dogs, hamburgers, and corn on the cob, along with a wide array of salads, fruits, desserts, and watermelon! There was, or so it seemed, enough to feed and army. It’s funny, years later when looking through family photo’s the only photos of my Father were of him cooking at our cookouts, and he was always smiling and happy! To go to the fireworks on the 4th of July we needed to leave town. For whatever reason, the town father’s of Concord never permitted fireworks, no matter what occasion. So after our fabulous cookout was all over and cleaned up, the gang all piled into various cars, and headed to the fireworks in neighboring towns. I can remember the anticipation I felt, along the excitement and happiness I experienced during throughout day. Along tired satisfaction I had as my Dad carried me up the stairs and put me into bed having fallen asleep on the ride home from the fireworks. These special days and events left vivid, loving, and lasting memories, which now cause me to smile and wipe away a happy tear or two for the good times long ago. Comments Off on Go Fly A Kite! Decluttering and Downsizing a Kitchen! Comments Off on Decluttering and Downsizing a Kitchen! Kitchens are a very special place for many people. They could be your domain, refuge, and gathering spot. Or it may be just a necessary evil that you need, but do not enjoy. However you feel about or use your kitchen, it might be either the first or the very last space in your home to declutter and downsize. One reason for this is there are so many nooks and crannies to store, put, and hide things. Oh, those nooks and crannies are wonderful until you try and find something. How many times have you tried to find something, couldn’t find it, and purchased a new one? Only to find the one you knew you had but it was shoved in the back of the drawer (or cabinet), hidden under a pile of other important items. This month let’s just tackle kitchen drawers, how bad can that be? The process will be the same or similar for all drawers, so just pick a drawer. In my kitchen we only have four drawers, 2 for utensils and 2 for junk! A Christmas presents started us to work on organizing one utensil drawer, however, once we got going one drawer lead to two; and we felt so good about the progress we ended up doing all four drawers. Insert drawer organizer and adjust size to drawer. Return items to drawer in the appropriate size space. Do not return duplicate items, unless they are different sizes of an item like spatulas or such. Duplicate items that you do not need, can be donated or given to someone, but don’t hang on to them. Like I said doing one drawer, was just the start of the project. All the other drawers were the same basic process, but the junk drawers took a bit longer. Junk drawers require looking through papers and things, so it is definitely something we put off as long as possible. Once you put back all the items in there appropriate compartments and toss or give the rest away stand back and admire the great job you did and how beautiful they look. It always amazes me when I am downsizing and decluttering closets how many shoes people have. Not just women, but men too! People seem to have a real issue throwing away or even donating, unused and older shoes. Scattered on closet floors, hanging over doors in bags, and the real serious shoe people have them methodically stored in plastic boxes labeled by color and style. If they get really carried away, or leaning toward obsessive compulsive behavior they will even make a note to what outfit and handbag it goes with! Makes you want to ask; Is it a shoe fetish or just a love affair with shoes? I freely admit that I love shoes! Shoe shopping is really the only shopping I truly love. There is something about the new shoe smell (something like a new care smell), trying on new shoes, and visualizing what outfit you will wear with them. This is why I love to buy new shoes, BUT my question is; Why is it so difficult to part with shoes once they no longer meet our needs? They are still comfortable (unlike other pieces of clothing) and still look reasonably good. They make me feel good, beautiful, or whatever. I still like the style and have not been able to find another pair in that color or heel height. They just do not make shoes like these anymore. I have an odd shoe size and they are hard to find. They are classic, never go out of style, and go with everything! These are my excuses, I am sure you some of them or have your own perfectly valid and rational reasons for hanging on to shoes for longer than reasonably necessary. So what are shoe lovers to do, when shoes tumble out of your closet, or worse yet you need a whole closet for only your shoes? It is difficult, but tough decisions must be made. Separate shoes that you wear regularly and put them to one side. Ask the question – How often have I worn these shoes and outfit in the past 12 months? If the answer is zero to 2, seriously consider donating the shoes and the outfit. Then take a look at the shoes that you cannot remember when you last wore them and toss or donate them. Separate the regularly worn shoes from the ‘special’ shoes in your closet, then when you buy a new pair evaluate whether to retire a pair from either collection, and DO IT! Just like Neil Sedaka’s song says, Breaking Up Is Hard To Do, when you have this love affair with shoes it is really hard. However, I know we will all find another pair of ratty, old sneakers or comfortable boots to fill the void in our heart. Comments Off on LOOK BEFORE YOU LEAP! Are you or someone you know . . .? Preparing to enter the spring real estate market? Overwhelmed with all that needs to be done to get ready? Has limited time or energy to do everything? That needs help on where to begin, who to call, or how much time this process will take? If you do, I can help! During February, I have an extra day to help you! to downsize and preparing for the move. A written summary of primary action areas and dates to meet to complete project on time. An Opportunity to save $75.00 or more* on a WITTZ END service package IF booked during your Strategy Session! *Save $75.00 or more on a WITTZ END service package (depending on package size), when booked during your strategy session. Everyone receives the written summary just for booking strategy session. Now That The Funeral Is Over, Now What? Comments Off on Now That The Funeral Is Over, Now What? For the past several days, actually several months, this family the moment on the moment and that was just dealing with todays problems, situations, and concerns. With the death of their parent their primary focus then shifted to just getting through the funeral. This family has several Now What questions to deal with immediately, because there is a surviving parent that has some concerns and issues that need consideration. So before all the family members start to scatter back to their ‘normal’ life; work, family, soccer games, PTA, etc., it is time to focus on the ‘Now What?’ questions. Everyone needs some down time, particularly after what they have dealt with, but first question and most pressing one now is: Can Mom (or Dad) stay in the family home alone, or would it be better for her to go home with someone? Once decided then you can move on from their. Whether Mom stays at home or temporarily goes with one of the children the rest of the Now What’s will wait for another day. What Your Mom is Not Telling You About Your Father. Comments Off on What Your Mom is Not Telling You About Your Father. When we live busy lives with spouse and children to care for we are often caught not spending enough time with our aging parents. If we are fortunate enough to live close to them, we might drop over quickly to see if they need something but often than not we will phone to check in. The phone call is quick and expediant. A quick hello, how are you, the kids are fine, and then you say goodbye because you need to get dinner or something. Mom said everything is fine, so you take her at her word. Even if you stop by periodically you run in for a few minutes, chat about the weather and things, then you are off again. Unfortunately, that is life these days. However you might be missing some vital signals and warning signs that unless you see first hand and ask the questions you will never know. Why? Because Mom, doesn’t want to bother you, and your Father told her not to tell you. Whatever it is, is their little secret. This happens quite frequently. As the folks age and continue to live alone and are independent, we become comfortable not having to worry about them. It is important that we periodically take some quality time with your parents to see how they are actually doing. Develop a base line measure of their life, activities, and physical abilities. Then as time proceeds do it again, just to stay tuned in to the subtle changes that may be occurring. Life is funny, we think we will have the folks forever, then without warning — or was there some warnings and signs — they are old and sick. We didn’t see it coming.